Personal checks are the size of US paper currency and can easily be fit into your wallet. Personal checks are available in a wide variety of colors and styles and can include a range of images that reflect the personal tastes of the individual. 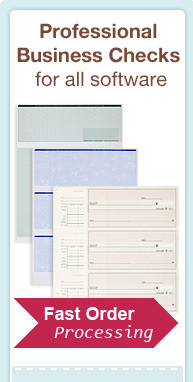 Personal checks are generally handwritten but printed checks are being used more for personal use as well. Business checks are larger so that they can be printed more easily and can be used in a ledger which makes accounting easier. Business checks may also be handwritten. The difference in size between business and personal checks also serves to differentiate between the two, but there are no legal requirements for a business check to be larger than a personal check. In fact, the color and size of the check has no bearing on whether the check can be cashed or not. A business check that has a picture of puppies and kittens on it is just as valid as a standard blue safety check, but that just wouldn’t look very professional -- unless you run a veterinary clinic or pet store, and even then it’s generally not a good idea to get too cute or clever with your business checks. The design should be simple, functional and yes, boring. This will fit give your checks the professional image a business needs to maintain. The larger size allows room for the company logo to be printed on the checks, which will enhance a corporate profile and lends to a more professional institution. Business checks generally have more security features than personal checks. Businesses are required to make an effort to protect their documents from fraud. They must show due diligence in securing checks or they run the risk of being financially liable. There are a number of security features available for business checks including holograms, fluorescent fibers, watermarks and heat sensitive ink. These business check security features can help protect companies from check forgery, check copying and what is known as check washing where the pay amount and “to the order of” lines are removed with chemicals. High security laser checks can include features on the face of the check such as chemical reactive paper, prismatic multicolored background and a high-resolution intricate border. The reverse side of the check can also have additional security features such as security weave, void indication, fugitive ink and a chemical wash detection box. An even more important reason to use designated business checks is that they may be ineligible for automatic conversion, which provides even more safety and security. Checks that are presented for payment may be converted to an ACH debit for payment. Often, businesses don’t wish their accounts to be debited electronically. It’s often better to have a copy of the paid check which can be retrieved for proof of payment or for other reasons. There is no easy way to prevent a check from being converted to an ACH debit without your knowledge. The most certain way to prevent a check from being converted is the presence of an Auxillary on-us field (Aux on-us), which is present only on business checks. will appear in the leftmost position of the MICR line, before the routing number field. If an External Processing Code (EPC) is included in the MICR line, the Auxiliary On-Us field will appearto the left of it. If you are a small business owner, there are a number of reasons why it is a good idea to keep two separate checking accounts: one for business check and one for personal checks. The most obvious reason is so you can keep your books straight and not intermingle your finances. Another reason is the image it conveys of you as a business professional. Perhaps a more important reason is to legally protect yourself. If you set up a LLC or incorporate your business, this offers you legal protection in the event your business should go in bankruptcy. Incorporation means that no one can go after your personal assets to cover a business debt. If you mix your finances together, however, it will be much more difficult to make this case in court. When tax time rolls around having separate business checks and personal checks will make filing much easier. Personal and business expenses need to be kept separate, but this line can become blurred if you are using one account for both your business and personal expenses. If you run a home-based business and do not have a separate business checking account, you may have a hard time convincing the IRS what your business versus your personal expenses are. Save yourself a headache and set up a business checking account when you set up your business. Getting into the habit of keeping these two things separate will save you time and stress down the road. The importance of having a separate business and checking account, as well as having business checks with high security features, will help protect you and your business and help you stay organized and on top of your finances.